Tá Tony Birtill i ndiaidh dul faoi chló is faoi chlúdach leabhair, ach is é an dóigh gur brúdh air an leabhar a chur de agus le scéal tábhachtach a bhí contráilte a chur ina cheart. Seolfar dhá leabhar le linn Féile Learphoill a bheas ar siúl an mhí seo 10-20 Deireadh Fómhair. 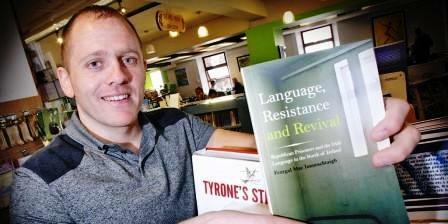 Beidh Language, Resistance and Revival: From Prison to Community le Feargal Mac Ionnrachtaigh á sheoladh in Ionad Ealaíne The Bluecoat ar 17 Deireadh Fómhair ag 7 i.n. Beidh an tOllamh Phil Scraton, Ollscoil na Banríona, Béal Feirste ag cur an údair i láthair. Rinne Robert McMillen agallamh le Feargal Mac Ionnrachtaigh i Mí Iúil (Beo eagrán 147) agus beidh suim ag muintir Learphoill in athbheochán na Gaeilge i dtuaisceart Éireann agus i streachtailt na teanga sa Cheis Fhada. Leabhar a scríobh mé féin, mura miste leat, an dara ceann: Hidden History: Irish in Liverpool / An Ghaeilge i Learpholl (ISBN 9780956452719; ar £5) agus tá sé le seoladh Dé Sathairn 12 Deireadh Fómhair san iarsmalann ag an Pier Head, Learpholl ag 3 i.n. Bhí orm an leabhar seo a scríobh chun an fhírinne a insint faoin Ghaeilge sa chathair. I mBéarla atá sé - cé gur scríobh mé sraith altanna ar an ábhar seo do Beo.ie (eagráin 93, 94 agus 98), tuigim gur teanga mhionlaithe atá inti agus mar sin, is é an leagan Béarla den stair atá chun tosaigh agus tá leabhar amháin go háirithe go mór faoi thrácht sa chathair: Irish, Catholic and Scouse: The History of the Liverpool-Irish 1800-1939 le John Belcham (LUP 2007). Dá réir seisean, Béarlóirí ab ea na hÉireannaigh a tháinig go Learpholl sa tréimhse sin - ní raibh aon ‘lingusitic difference’ le háireamh ina measc dar leis. Ní raibh iontas orm a fheiceáil nach raibh foinsí Gaeilge i leabharliosta Belcham, agus sin fadhb atá ag a lán staraithe in Éirinn féin, fiú amháin, mar atá mínithe ag Breandán Delap i mBeo na míosa a chuaigh thart. Ach ní leor a bheith ag gearán - bhí orm fianaise a fháil chun a chruthú go raibh Gaeilge ag formhór na nÉireannach a tháinig i dtír i Learpholl sa 19ú aois. Buíochas le Dia, tá neart fianaise ann. Cuirim i gcás an achainí a shínigh 24,000 Caitliceach Éireannach i Learpholl (leath den mhéid Éireannach a bhí sa chathair i 1842) chuig an Vatican. Ba é an gearán ba mhó a bhí acu nach raibh go leor sagart le Gaeilge sa chathair. Ní raibh cuid mhaith den na hÉireannaigh i Learpholl dá bhrí sin in ann dul chuig faoistin os rud é nach raibh mórán Béarla acu. De réir leacht cuimhneacháin ag Clarence Dock, Learpholl, tháinig 1,300,000 Éireannach i dtír ansin 1845-52, ag teitheadh ón Drochshaol in Éirinn, go mór mór ón iarthar - áiteanna mar An Clár, Corcaigh, Gaillimh, Ciarraí, Maigh Eo agus Sligeach. De réir an daonáirimh 1851, ba Ghaeilgeoirí iad, formhór na ndaoine sna contaetha thuas luaite, agus de réir finnéithe, mar an eaglaiseach Úinitéireach, an tOirmhinneach John Johns, ní raibh Béarla ar bith ag cuid de na hÉireannaigh a casadh dó i Learpholl sa bhliain 1847. Mar a scríobh mé in eagrán 93 de Beo.ie, ní raibh dídeanaithe áirithe in ann fianaise a thabhairt don choiste cróinéara mar ní raibh Béarla ar bith acu, agus de réir taighde a rinne an eaglaiseach Protastúnach Abraham Hume, bhí na mílte Gaeilgeoirí ina gcónaí i dtuaisceart na cathrach, idir Chaitlicigh agus Phrotastúnaigh. Ar an dea-uair, tá leabhair scríofa ag beirt de na dídeanaithe a tháinig trí Learpholl in am an Drochshaoil agus a chuir fúthu i Lancashire: Mícheál Dáibhéid (1846-1906) agus Marcas Ó Roighin (1844-1940) , beirt a bhí bródúil i gcónaí as a dteanga dhúchais agus a thug tacaíocht do Chonradh na Gaeilge nuair a bunaíodh é 1893. 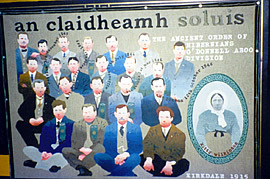 Bhí daoine ón dara glúin i Learpholl gníomhach sna craobhacha de Chonradh na Gaeilge: daoine mar an file Piaras Béaslaí (1881-1965), agus na healaíontóirí Cesca Trench ( 1895-1918) agus Norma Borthwick ( 1862- 1934). Nuair a bhain Alphonsus Ó Labhradha an chéad duais i gcomórtas drámaíochta an Oireachtais le An tSnaidhm i 1910, dúirt sé nach raibh ach ceithre lá caite aige in Éirinn riamh. Tá an leabhar ar fáil ag News From Nowhere, 96 Bold Street, Liverpool L 1 4HY News From Nowhere.